Sometimes, realistic things are the scariest. While vampires and werewolves might be fictitious, psychopaths and the deranged definitely are real. 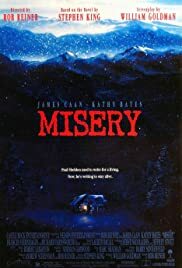 I think that’s why Misery was such a great movie (and book!) This is my pick for Day 11 of my 31 Days of Halloween. First, Kathy Bates is a fantastic actress, so this is worth seeing just to watch her in this role. Also, this is one of the least scary movies on my list, but I wanted to include it because it’s just psychologically interesting. Real people can be every bit as horrifying and damaged as this woman. It’s a fascinating analysis of what might constitute a number 1 fan of something. Sometimes, people just break loose from reality in their mind and there can be terrifying results.